Enjoy adorable cats with our Wallpaper app in the Nook Marketplace! 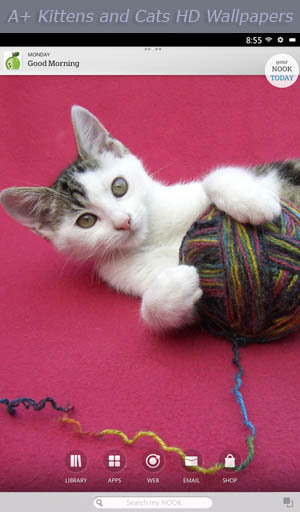 Cute kittens and cats enliven your device! Enjoy over 30 revolving, adorable professional cat wallpapers. Plenty of cats, kittens, and a few wild cats to entertain you in pleasing natural backgrounds with captions! Each high resolution photo is optimized specifically for your device Color/Tablet/HD/HD+. Our A+ Wallpapers consistently receive top ratings. These revolving wallpapers change automatically each week, day, hour, or stay on a single photo. Change cat photos any time with a swipe up or down! Have fun personalizing your device home and lock screens. And check out our popular "A+ Animal Babies", "A+ Candy Color" and "A+ Animal Antics" HD Wallpapers too! 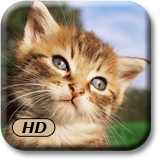 Now tap the A+ Kittens and Cats HD choice.